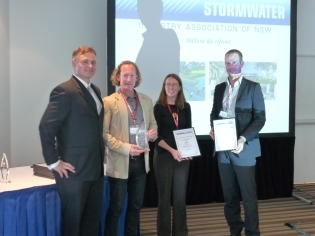 October 2013: We are proud to have won a number of NSW Stormwater Industry Association awards in 2013. 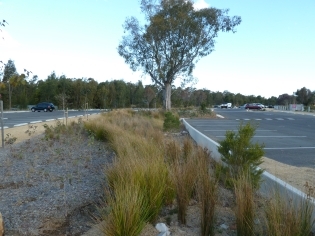 Equatica, McGregor Coxall and Western Sydney Parklands Trust won the award for Excellence in Infrastructure, for stormwater management at Pimelea (now known as Lizard Log). Blacktown City Council's Blacktown Showground also won the award for Integrated Stormwater Design. Equatica developed the designs for the showground's new bioretention and wetland stormwater treatment and reuse scheme. Alexa McAuley and David Knights also won an award for the best paper at the stormwater conference, for their paper on "Why we need an urban stormwater harvesting policy". The awards were presented at a gala dinner in the Blue Mountains earlier this month as part of the Stormwater NSW Conference. September 2013: Equatica has two projects which have made the finals for the NSW Green Globe Environment Awards. The Green Globe Awards are NSW's leading environmental awards recognising environmental excellence, leadership and innovation. Waverley Council's Bondi Stormwater Harvesting and Reuse Scheme has been selected as a finalist in the Water Efficiency Category and Warringah Council's Cromer Park Stormwater Harvesting and Reuse Project has been selected as a finalist in the Local Government Sustainability Category. Equatica undertook the design for both projects. August 2013: Congratulations to Leichhardt Council who have just been awarded an estuary management grant from the NSW state government. The project is to convert an existing sediment basin, currently filled with typha, into a stormwater treatment wetland for both stormwater flows and baseflows elevated in nutrients. Equatica assisted Council to put the grant application together and are currently completing the detailed designs. 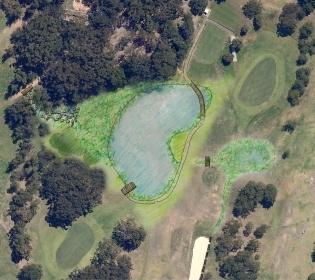 The design also includes reuse of the treated water for irrigation of Blackmore Oval. 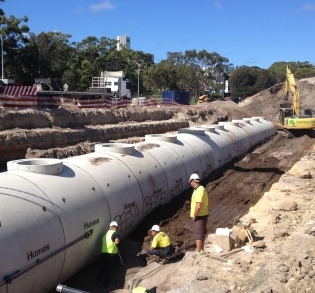 July 2013: Equatica has been assessing the feasibility of harvesting stormwater at eight sites in Warringah LGA. 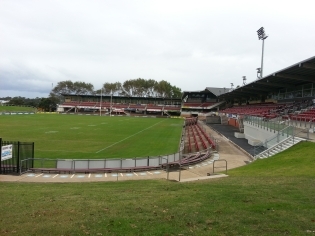 The sites include a number of sports fields, including Brookvale Oval, home of the Manly Sea Eagles Rugby League Team, and Dee Why Town Centre, where there is potential for a stormwater harvesting scheme to provide an alternative water supply to future redevelopment. Warringah currently uses bore water at a number of sports fields and aquifer storage and reuse was also investigated and found to have good potential at a number of Council's sites. 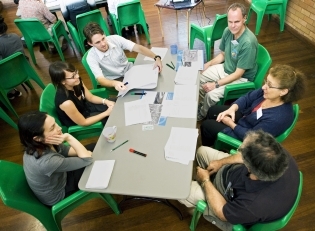 June 2013: Earlier this year, Equatica ran a workshop with Marrickville Council for community members interested in WSUD. With the workshop participants and Council's plumber, we built a small rain garden at Council's Tom Foster Community Centre in Newtown. The rain garden treats runoff from part of the centre's roof and is approximately three square metres in area. Many hands make light work, and the whole rain garden was built in around three hours. There is more information on Marrickville Council's WSUD community workshop series on Council's website. 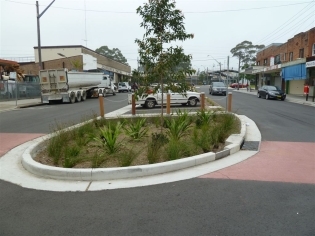 May 2013: Bankstown City Council has recently designed and constructed a series of streetscape rain gardens as part of the Panania Town Centre Upgrade. Equatica provided advice to Council on the design and construction of the rain gardens. We visited the site this month and they are looking great. 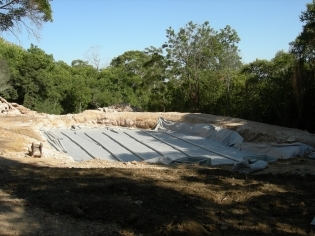 April 2013: Equatica is currently working with Henroth Investments on the re-development of the Kirrawee Brickpit. 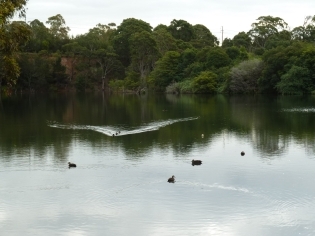 The former brick pit is now a large pond which is currently frequented by grey headed flying foxes and other bats who use the pond to cool off in hot weather and for drinking. 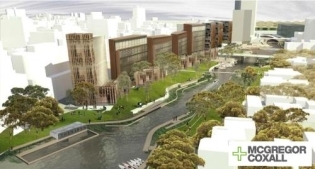 The site is being redeveloped to accommodate residential apartment buildings, however a key part of the design is to retain a water body for the avifauna. Equatica is working with the design team to design the water body, ensuring the water quality in the pond meets the bats' requirements. The water will be recirculated through a wetland to reduce residence times and maintain high water quality within the pond. March 2013: We have enjoyed the recent rain as an opportunity to get out and see some of our work in action. Late in February we visited south-western Sydney, including new bank restoration works on Orphan School Creek at Fairfield West. You can see what this site used to look like on our waterway restoration projects page. 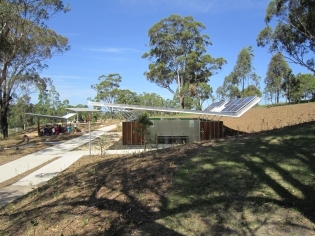 February 2013: Equatica has designed a green roof stormwater treatment system at the new Blue Mountains World Heritage Cultural Centre at Katoomba. Believed to be the first of its kind in Australia, the green roof takes stormwater from a large viewing platform, treating the water in the roof garden before discharging any excess treated water to the Blue Mountains National Park. The green roof is vegetated with species from the local cliff top heathland, which grows in hot dry environments in shallow soils. The treatment system was completed late last year. January 2013: Western Sydney Parklands' Lizard Log (formerly Pimelea) won the inaugural Premier's People's Choice Award for Landscape Architecture. Equatica worked with Mcgregor Coxall and the Western Sydney Parklands Trust to incorporate a number of environmental initiatives including greywater treatment, stormwater harvesting and reuse and water quality improvements at Lizard Log. 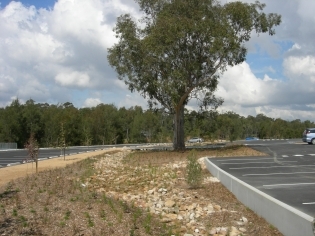 In the new car park a bio-infiltration swale was constructed (as pictured) to convey the runoff from the carpark as well as provide water quality treatment for infiltration of runoff. 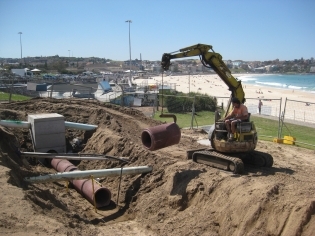 December 2012: Equatica recently completed a project with Waverley Council to design a Hydrocon exfiltration stormwater quality treatment system at Bondi Beach. The system was designed to treat runoff from Campbell Parade which delivers oils and grease, heavy metals and other contaminants directly to Bondi Beach during rainfall events. Photo supplied courtesy of Corey Fox (Waverley Council). November 2012: Equatica recently participated in the Design Parramatta project with three design teams. We worked with Turf Design and Environmental Partnership on the River Square site, the NSW Government Architect's Office on Clay Cliff Creek Parklands and Gallagher Ridenour on Horwood Avenue Civic Link. Design Parramatta involved sixteen teams developing concepts for public spaces in the Parramatta CBD, with an emphasis on multidisciplinary collaboration and progressive ideas to transform the city. The three projects we worked on all involved WSUD elements as a key part of the design concept. 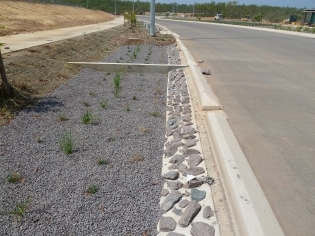 October 2012: Equatica has developed a WSUD Strategy for Stage 2 of Zuccoli, a new residential suburb in Palmerston, NT. The first part of the strategy involves more than 1,100 square metres of streetscape rain gardens, which have been constructed along the main spine road of the development. Construction has been completed prior to the upcoming wet season. September 2012: Equatica is proud to have been involved in both of the Sydney projects which recently received funding under Round 3 of the Federal Government's Water for the Future Stormwater Harvesting Grants. At Hurstville Golf Course, Equatica has been working with Hurstville City Council since 2010, undertaking concept and detailed designs, as well as assisting with the grant application. Currently we are providing construction supervision services at this site. The project won $1 million in funding which will allow the expansion of the stormwater harvesting scheme. At Canada Bay, Equatica worked with Permeate Partners and Council in 2011 to develop a non potable water supply strategy for Council's parks. Based on this strategy, Council has received almost $2 million in funding. 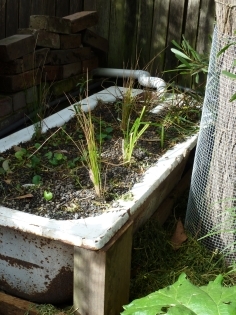 August 2012: Equatica has recently led a workshop with Marrickville Council and local residents to construct a vertical upflow wetland to treat greywater. The greywater wetland has been constructed using an old bath salvaged from the tip and locally native wetland plants. The treated water is used for garden irrigation via a sub-surface irrigation trench. 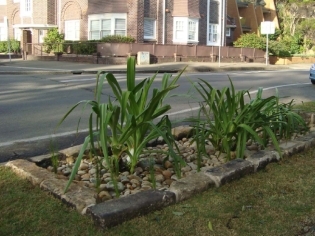 July 2012: Equatica recently completed designs for a series of three small rain gardens for Manly Council. They are located along East Esplanade and treat runoff from the road before it enters Manly Cove. The Council construction team did a fantastic job with great attention to detail in constructing the rain gardens including working carefully with a heritage sandstone kerb. June 2012: Equatica is currently working with Tonkin Zulaikha Greer and McGregor Coxall on a Master Plan for a new cemetery in the ACT. Equatica is preparing a water cycle management strategy, which includes measures to reduce water demands, harvest water for reuse and protect natural waterways on site. We have also provided design input into two water bodies which will form features of the site. A key challenge at this site is that with a small catchment and variable rainfall, water levels in permanent water bodies will fluctuate significantly. Our water balance modelling has helped the design team to understand this challenge and design the water bodies accordingly. May 2012: Equatica is currently working with Rockdale Council to undertake water quality monitoring at 17 sites across the LGA. This will be the first time that a comprehensive assessment of Rockdale's waterways has been undertaken for more than ten years. As part of this project Equatica will also undertake statistical analysis of the water quality data to detect patterns and to also benchmark Rockdale's waterways with other urban receiving waters in Sydney. There's more information about our monitoring experience on our monitoring projects page. 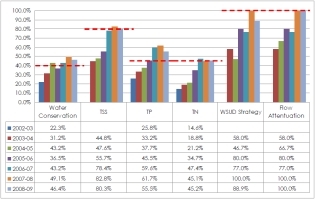 April 2012: Currently Equatica is reviewing each of Landcom's projects to benchmark their performance against water management objectives. We have undertaken this review each year since 2008, and it forms a key component of Landcom's annual report. You can view the 2011 annual report on Landcom's website and you can read more about our work in policy and planning in our projects pages. March 2012: Last month, Equatica attended the WSUD2012 conference in Melbourne. David and Alexa both presented papers, which can be found on our publications page. While in Melbourne we also used the opportunity to visit a number of sites. We saw some interesting and innovative designs, including this bioretention system at the Royal Botanic Gardens. 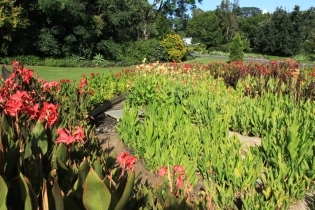 A Canna Lily bed has been re-constructed as a bioretention system to treat stormwater runoff from a local catchment. February 2012: Equatica is currently working with Australand on a WSUD Strategy for the next stages of the Discovery Point development. 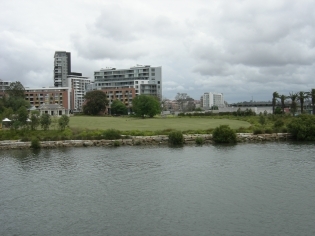 Discovery Point is a large brownfill re-development site located on the lower Cooks River (pictured) in Sydney's inner south. Equatica is working with the design team to develop a number of stormwater treatment systems to fit into the streetscapes and parklands within the development. One challenge for WSUD at this site is that there are only small areas of natural soil. More details are available on the AILA website. December 2011: Equatica is working with the NT Government to develop a WSUD Strategy for the new residential subdivision of Kilgariff in Alice Springs. Alice Springs has a desert climate, with an average annual rainfall of less than 300 mm, while average annual evapotranspiration is more than 3,000 mm. The Kilgariff WSUD Strategy is based on stormwater treatment and infiltration to protect St Marys Creek (pictured right) from erosion. Conserving water is also a priority at the development and wastewater reuse is proposed, linked with Power and Water Corporation's wastewater reuse scheme for Alice Springs. November 2011: Equatica is working with Blacktown City Council and McGregor Coxall to develop designs for the revitalisation of Council's Blacktown Showground. The Showground will ultimately include three new community buildings, a plaza, a large village green event space, a new children's playground including water play and a community garden. 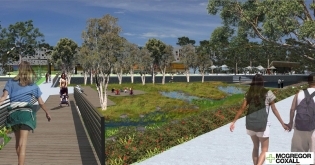 The site will also highlight Blacktown Council's commitment to sustainable water management. 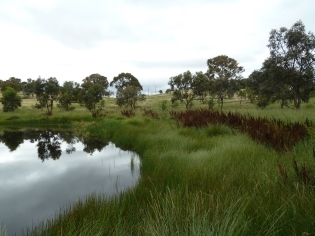 The showground will provide ecosystem services by treating a substantial portion of Blacktown CBD catchment on the site in a feature wetland and bioretention system. The treated water will be stored in a 1000 kilolitre underground storage tank and will be reused at the Showground for toilet flushing and irrigation on the site. 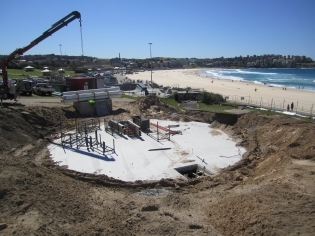 October 2011: Based on detailed designs completed by Equatica, Waverley Council's Bondi Beach stormwater harvesting scheme is currently under construction. The hill-side park at the southern end of the beach was excavated for installation of the 300 kL stormwater storage tank in September. The scheme will intercept flows from a trunk drainage line that discharges to the southern end of the beach, as well as local road runoff from Campell Parade, which will be treated in a bioretention system. 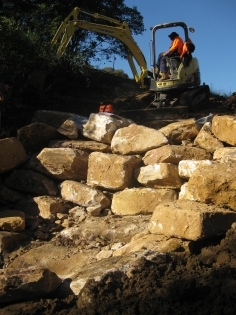 September 2011: Equatica has been working with Mcgregor Coxall on Stage 2 works at Pimelea in the Western Sydney Parklands. 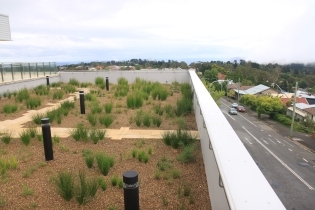 Stage 2 works include a carpark with a bio-infiltration swale to drain the runoff, a combined greywater and stormwater wetland and re-habilitation of a degraded creekline. One of the key principles driving the design of the carpark was to use surface drainage and avoid the need for pits or pipes. 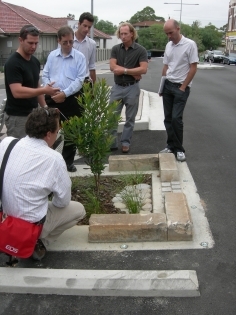 August 2011: In 2009, Equatica completed a sub-catchment management plan for Marrickville Council's Tennyson Street sub-catchment, working in collaboration with Council and the local community. The plan sets out a strategy for sustainable water management in the catchment, including an action plan for on-ground works. Recently Marrickville Council constructed the first bioretention system in the catchment, based on Equatica's concept design. July 2011: Equatica is currently preparing for this year's NSW Stormwater Industry Association conference, which is on in September. We are working on four papers and also presenting a pre-conference workshop. The workshop will allow participants to bring along their own WSUD projects for discussion, design advice and problem solving. We're hoping to have lots of interesting projects to workshop, so if you have a project which needs some attention, or if you're interested to learn from other challenging WSUD projects, you can find more information and register via the conference website. Also last month we welcomed a new member to the Equatica team - Andrew McMillan joins us, adding to our capabilities in design and analysis. You can find out more about Andrew's experience on our people page. June 2011: Lois Oulton, pictured here, is a PhD student at Macquarie University, looking at the effectiveness of WSUD treatment systems. She is currently monitoring water quality for several stormwater treatment systems in the Cooks River catchment. Lois is looking at the impact of the stormwater treatment systems on pollutant concentrations and loads, and on the health of aquatic fauna. Equatica is an industry supervisor to Lois and we have been providing technical advice on the design of the monitoring program and the treatment systems. 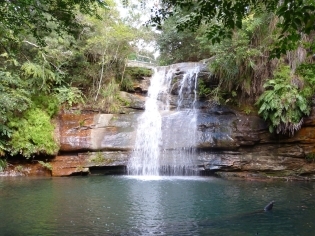 May 2011: Equatica is working on a project with Ku-ring-gai Council to develop catchment management plans for Gordon Creek (in Lindfield/Killara) and Lovers Jump Creek (in Turramurra/Warrawee/Wahroonga). Council is looking for opportunities to improve stream health and protect the creeks from ongoing development in the catchments. We'll apply the latest ideas from recent research to develop the plan for each catchment, but just as exciting has been the opportunity to discover these creeks for ourselves. Despite existing development, both creeks remain in relatively good condition, and include hidden gems such as this waterfall on Lovers Jump Creek. 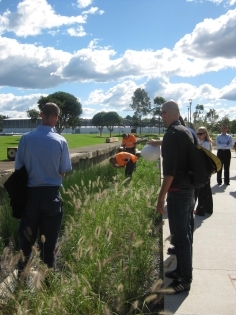 April 2011: Equatica is currently working with a range of Sydney Councils to test the hydraulic conductivity of bioretention systems. Equatica recently ran workshops for Bankstown Council and Strathfield Council to demonstrate how to undertake the hydraulic conductivity testing and to explain some of the basic theory behind it. 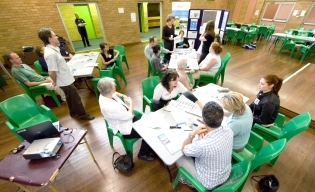 Equatica is running more workshops this month for Canterbury, Rockdale and Marrickville Councils. March 2011: Equatica is currently providing construction supervision services for the Bellamack residential subdivsion in Palmerston, NT. 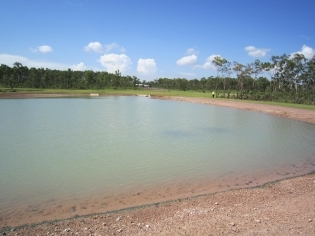 The development is currently in the civil works and house construction phase, and Equatica is working closely with the NT government to ensure that during this wet season, sediment runoff from the upstream development is minimised. 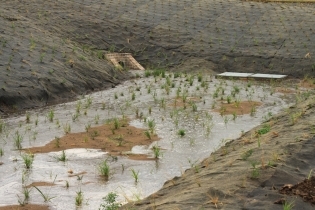 A constructed wetland and bioretention basin have been constructed to their first stage, and are currently working as sediment control devices. These systems have been thoroughly tested in the last few months - this wet season has been Darwin's wettest on record, with more than 3000 mm rainfall to date. This is more than 500 mm higher than the previous record! 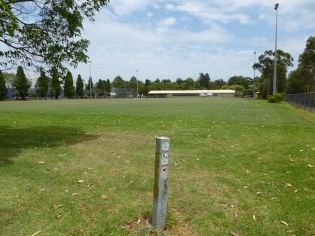 February 2011: Equatica has designed a stormwater harvesting scheme for the Crest sporting complex, in Bankstown LGA. Construction is nearing completion, and Equatica did a wet weather site visit in February. The works included expansion of the existing Criterium Pond so that it can store more water. Water will be pre-treated in a new gross pollutant trap and a bioretention system upstream of the pond, and then polished with a filter and UV system before topping up irrigation header tanks around the complex. The harvesting scheme has been designed to meet a significant proportion of irrigation demands, as well as maintaining the health of the Criterium Pond, improving stormwater quality and managing environmental flows in the catchment. 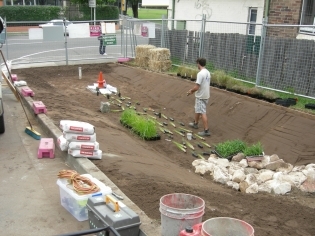 January 2011: Working with Marrickville Council and the local community, Equatica recently constructed a raingarden to treat runoff from a roof and a driveway at a single residential dwelling in Dulwich Hill. The raingarden is a simple way of disconnecting the impervious area of the house and providing passive irrigation for the landscape. Amazingly, the raingarden was constructed in only four hours with the willing help of local residents. The total cost of the material for the raingarden was less than two hundred dollars. We've prepared a step-by-step account of the raingarden's design and construction, with useful information in case you'd like to build one in your own back yard. 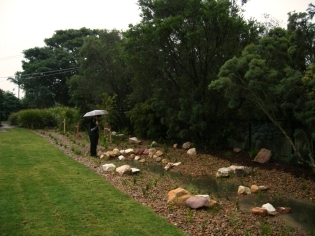 December 2010: Construction has just been completed on a new bioretention system designed by Equatica at Bundara Reserve, Beverly Hills. The project was completed for Hurstville Council, with funding also contributed by the Cooks River Sustainability Initiative. The bioretention system features a saturated zone and locally native plantings. Also this month, Strathfield Council has put their new WSUD DCP out for comment. Equatica helped Council prepare the DCP, including a reference guideline which accompanies the plan. Christmas period: We'll be closing our office from Christmas Day until Monday 10 January. We're looking forward to many more sustainable water management projects when we return in 2011! Bioretention system just completed at Bundara Reserve. Two swales deliver water into the system from the adjacent streets. November 2010: This month several of our projects are under construction, including stormwater treatment systems at Beverly Hills and Chatswood Mall and stormwater harvesting schemes at Bankstown and Katoomba. Work has also just been completed at Pimelea Park (pictured). Richard talked about incentives for facilitating the uptake of WSUD on existing private property. Copies of all the papers have been included on our publications page. October 2010: This month, Equatica and McGregor Coxall won the NSW Stormwater Industry Association Excellence Award for strategic planning, for the Mildura Riverfront Park project. Equatica also received a 'highly commended' award with Bankstown City Council for The Crest sporting complex stormwater harvesting project, and a 'merit' award with Strathfield Council for the Yarrowee Road wetland restoration project. Blacktown Council also won an Excellence Award for their WSUD DCP, which Richard helped develop in 2007-08. This short article (pdf) from Engineers Australia's Water Engineering magazine includes more information on this year's SIA awards. 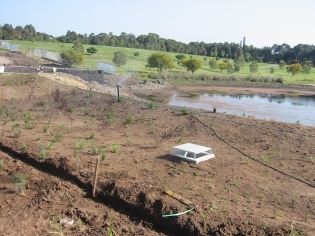 September 2010: Equatica and AECOM have designed a bioretention system fringing an existing urban pond at Sydney Park in St Peters, Sydney. One of the key drivers for the project is to supply good quality water to a series of ponds which currently have large evaporation losses. This project is stage 1 of a larger project to treat the 200 hectare Munni St Catchment which drains to Alexandra Canal. The Federal Government has recently announced grant funding for Stage 2 of the project as part of its Water for the Future stormwater harvesting fund. 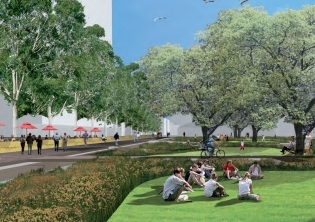 August 2010: Equatica is currently working with McGregor Coxall on the Callan Park Masterplan. This month, we participated in a project team workshop, where we were briefed on the outcomes of the community consultation process to date, and we began to build ideas for the park, based on the community's preferences. The park offers a great opportunity to implement sustainable water management principles in a unique urban setting. 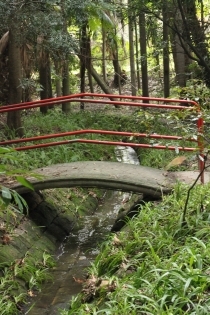 July 2010: This month, Equatica completed the design and construction of a stream rehabilitation project at St Marys. 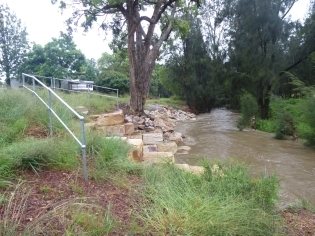 A small tributary of South Creek, previously actively eroding and infested with weeds, was stabilised by construction of a rock ramp and stilling basin. 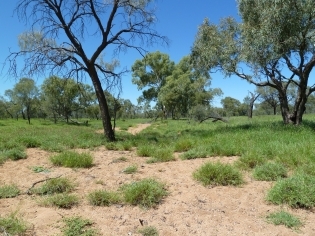 The site was revegetated with locally native species. More information is available under projects/implementation. June 2010: Equatica is currently working on an exciting project with Bankstown City Council and NSW National Parks, undertaking a concept design for works to restore Yeramba Lagoon. Yeramba Lagoon was once a tidal arm of the Georges River estuary, but a weir constructed across the mouth has eliminated tidal flows. A key goal for restoration is to reintroduce tidal flushing and estuarine habitat within the lagoon. 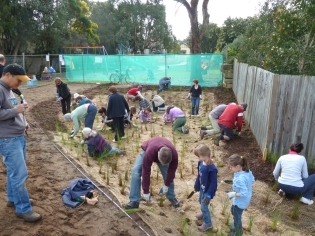 May 2010: This month, Marrickville Council organised a community planting day at the new Thornley Street bioretention system, designed by Equatica in collaboration with Sprout. There was a great turn out and we really enjoyed this chance for hands-on participation and interaction with the local community. There's more information about the project here, including photographs during construction. April 2010: This month, we are excited to see several of our projects under construction. Marrickville Council has just completed construction of two more raingardens in the Illawarra Road subcatchment, at Wallace Street (pictured) and Thornley Street. Canterbury Council has completed construction of the Highcliffe Road raingarden. Construction is also underway on the Meadowbank Park stormwater harvesting scheme in Ryde LGA, as well as the Mason Park stormwater harvesting scheme and Yarrowee Road wetland in Strathfield LGA. Construction is about to commence on a stream restoration project at South Creek in Penrith LGA. Equatica is providing ongoing advice at all of these sites, including construction supervision services at Yarrowee Road and South Creek. March 2010: This month, Equatica led the site visits of the Sydney Metropolitan CMA's WSUD Construction and Establishment training in Sydney. Equatica explained to participants the stormwater treatment systems at three sites - Sydney University, Glebe Foreshores and Pirrama Park, discussing key issues encountered during construction and establishment. Next month (20 April), Equatica is running an introductory MUSIC course in Sydney. Registration is available now. February 2010: We are working on a project with Auburn, Bankstown and Parramatta Councils to investigate options for sustainable water management in the Duck River Catchment. The project will identify alternative sources of water for open spaces within the catchment. In February we toured the catchment with each of the Councils to look at key sites. January 2010: We are currently working with McGregor Coxall and Parramatta City Council to develop WSUD principles and details for Council's Public Domain Guidelines. As part of the project, we also reviewed some recent WSUD projects completed by Council, including stormwater treatment systems at Guildford, Granville and in the Parramatta CBD. Over the Christmas break we also completed a major update of our projects page; it now includes information on a wide range of our projects. 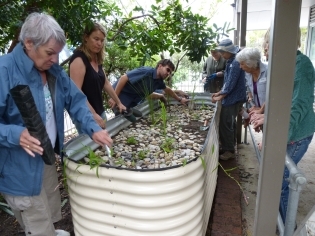 One recent highlight has been a community-led project to build a swale at a Bush Pockets site in Marrickville. Parramatta City Council have recently upgraded South Street in Granville Town Centre, incorporating stormwater treatment systems into the works. Equatica and McGregor Coxall visited the site with Council in January. We also have a new phone number: 02 8094 9703. Our postal adress remains unchanged (see "contact us"). Also this month, we're completing detailed designs for water management measures at Pimelea in the Western Sydney Parklands, including innovative systems for passive treatment of greywater and urine separation and reuse. At Pimelea we're working with McGregor Coxall, who are completing landscape designs for the park. 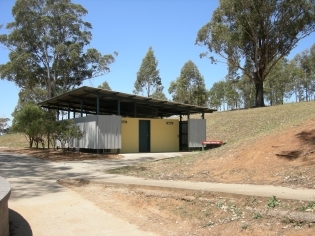 This toilet block at Pimelea will be refurbished, including systems for greywater treatment and urine separation and reuse. 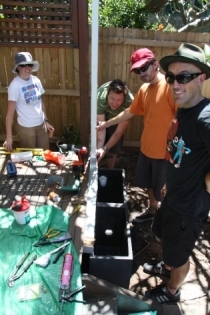 November 2009: Equatica constructed a small backyard wetland as a demonstration project for Marrickville Council, with the support of a local resident and the help of some enthusiastic volunteers. We've written up some notes on the construction process, with plenty of pictures. This month we also constructed a swale, as part of a community-initiated project in Marrickville. Local resident Michael Easton saw the opportunity and got us involved to help with the design and construction. There's more information about this project on the Bush Pockets website. Also this month, an article by Equatica's Richard McManus has been published in the WME Environment Business Magazine. The article discusses how councils can take water sensitive urban design to the next level: "Stormwater styling". 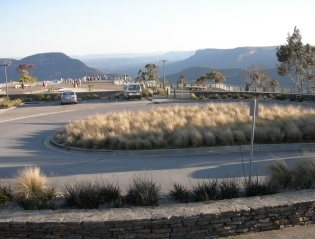 October 2009: Equatica has been working with Blue Mountains City Council to create a Green Precinct at the Three Sisters lookout at Echo Point, Katoomba. Equatica is currently working on the detailed designs to create a stormwater treatment and reuse system for one of Australia's busiest toilet blocks. The project is cofunded by the Federal Government's Green Precincts Fund. 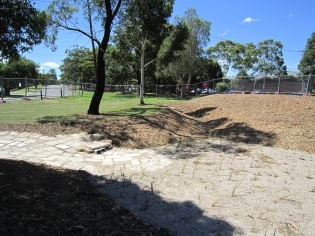 September 2009: Equatica is currently designing a stormwater harvesting system at Mason Park for Strathfield City Council. Stormwater will be harvested from adjacent private land, and will be stored and treated within the park for irrigating the playing fields. The site presents some difficult design constraints including contamined fill and acid sulphate soils. Equatica has been working with SESL to undertake site investigations at the start of the design process. 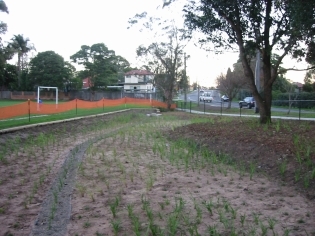 August 2009: the City of Ryde has recently completed the construction of a new bioretention system at Meadowbank Park. The system was designed by Equatica as part of the Meadowbank Park stormwater harvesting and reuse project. Designs have also been completed for stormwater harvesting, treatment and reuse to provide an alternative water supply for the park's thirteen playing fields. 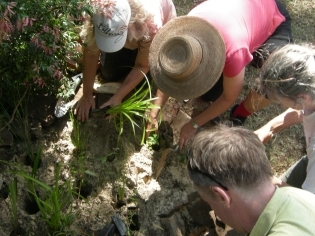 July 2009: Equatica and Marrickville Council have been running a Community WSUD Education program, including "WSUD on your property" workshops and site tours. Equatica has also been helping some of the workshop participants develop designs for WSUD on their properties. The program won a Highly Commended award at this year's NSW Stormwater Industry Association Awards of Excellence, presented at the recent SIA conference. 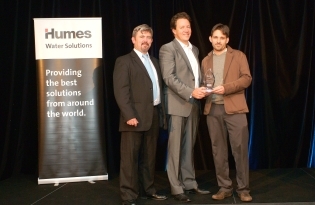 Sydney University was also a category winner for their WSUD initiatives, including three stormwater treatment systems. 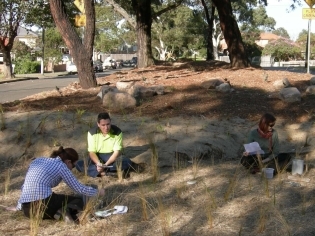 Equatica staff were involved in the Sydney University planning and design while at Ecological Engineering. Equatica also presented two papers at the conference, which have been added to the publications page. 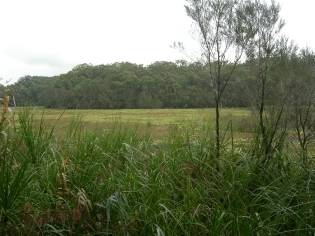 June 2009: Equatica has been working with Strathfield Council to develop designs for a bioretention swale in Chain of Ponds Reserve, Strathfield South. The swale was designed by Strathfield Council’s landscape architect with advice and review by Equatica. Since construction in May the swale has received more than 150 mm of rain. May 2009: Equatica has been working with the Northern Territory government to develop a WSUD Strategy for new development in the Darwin Region. 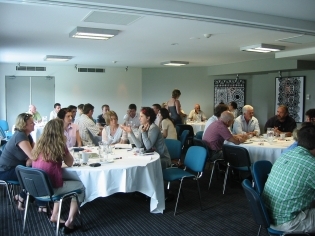 During May, the NT Department of Planning and Infrastructure and Equatica ran a series of training and capacity building sessions in Darwin, to introduce the WSUD Strategy, guidelines and tools to local practitioners. 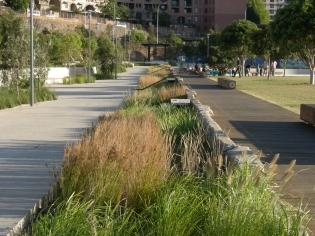 April 2009: Construction of bioretention systems is complete at a new park in the City of Sydney, at the former Water Police site in Pyrmont. Peter Gillam designed these bioretention systems and is pictured here with City of Sydney stormwater assets and park maintenance staff, discussing the long term operation and maintenance. April 2009: Peter Gillam has joined the Equatica team. Peter also worked with us previously at Ecological Engineering. For more information, see people. 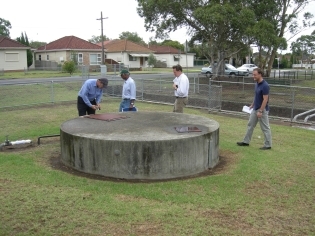 March 2009: Equatica has been assisting Hornsby Council on several concept and detailed designs for storwmater treatment systems. One of these projects is currently under construction in Cheltenham (pictured right). This bioretention system will include a saturated anoxic zone. February 2009: Equatica is looking for new staff! Please see WaterJobs for details. January 2009: Equatica is working with Ricc and Judi Rossi to transform a St Peters industrial site into artist's workshops with a live in studio. St Peters is undergoing an urban transformation and art is a key part of its identity. The site will have a green roof, rainwater reuse, greywater reuse and stormwater cleansing using green walls and planter boxes. More information is available in this document (pdf). Left: imagine this wall, at the Rossi's St Peters site, transformed into a green wall, cleansing stormwater. Right: Street art in a nearby St Peters laneway. 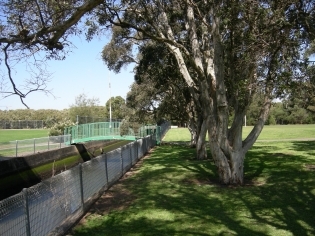 November 2008: Equatica is working with the City of Ryde to design a stormwater harvesting scheme for Meadowbank Park. October 2008: Equatica presented at the AWA Northern Territory branch's annual "Water in the Bush" Conference and undertook a site visit to Palmerston East with the NT Department of Planning and Infrastructure. September 2008: As part of the WSUD in Sydney Program's Sustainable Water Challenge, Equatica guided participants around the WSUD features at Sydney University and Prince Henry at Little Bay. 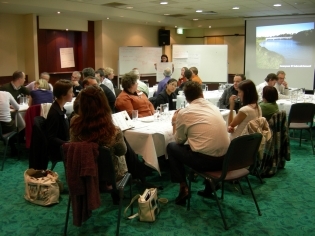 August 2008: Marrickville Council and Equatica faciliatated a water management planning forum in the Tennyson Street subcatchment. 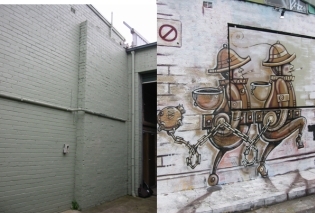 July 2008: We've just moved into our new office in Surry Hills. You can now contact us here.